Shortly after Jamie and Emily were born prematurely at 27 weeks on March 25, 2010, doctors told Ogg and her husband David that Jamie had died. Nurses placed his limp body across his mother’s bare chest so she could say goodbye. But after five minutes, Jamie began to move. The baby’s doctor told the Oggs his movements were reflexive and not a sign of life. But as his mother continued cuddling him, Jamie opened his eyes. Kate put some breast milk on her finger, and he eagerly accepted it. Their tiny baby grew stronger and stronger in his mother’s arms, and their final goodbye turned into a hello. 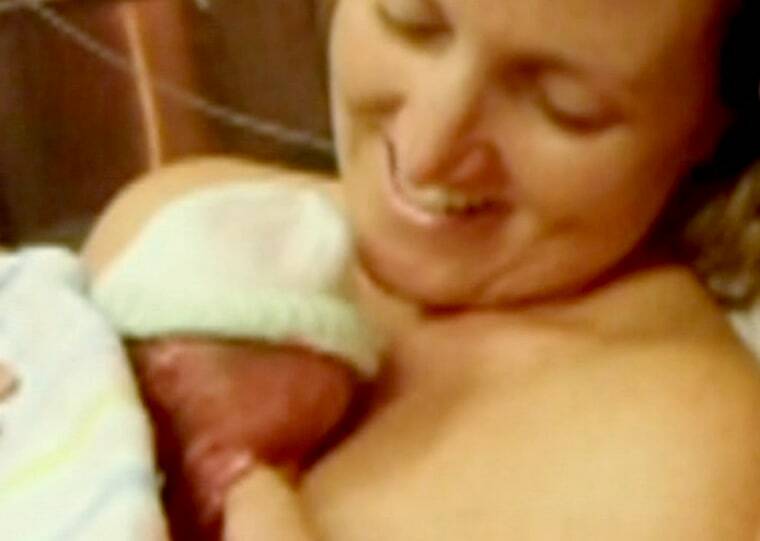 The Oggs’ experience garnered international media attention and dramatically highlighted the benefits of parents holding newborns skin-to-skin on their bare chests, which is commonly called “kangaroo care.” Though the medical benefits of skin-to-skin contact are well documented, it's still not encouraged, or even allowed, at many hospitals. Jamie and Emily, now nearly 2, are doing great, Kate Ogg said in a Skype interview as she and her husband held the tow-headed toddlers on their laps. In November, the family moved from Sydney, Australia, to a home with an ocean view in Nelson, New Zealand, “a very chilled-out town,” she said. The twins’ last checkups showed they are developing completely normally, she said. To demonstrate, she asked, “Where’s your nose? Where are your ears?” and the twins pointed to the correct body parts. “Where’s your belly?” she asked, and the kids obediently lifted their shirts. As the spotlight faded, the Oggs returned to normal life as a happy family – and these days they have a new blessing to count. The big news lately in the Ogg family is that Jamie and Emily now have a little brother, Charlie, born April 27. Jamie and Emily were conceived via in vitro fertilization, and the Oggs had planned to try it again when the twins turned 1. So Kate Ogg was pretty surprised when she learned she was already three months pregnant before the twins were even a year old. She hadn’t undergone any fertility treatments and figured her missed periods were due to breastfeeding Jamie and Emily. Charlie Ogg also tried to arrive extremely early, at 20 weeks, but made it to term thanks to stitches to close his mother’s cervix and the hiring of an au pair to do the heavy lifting with the twins while mom was on bed rest. She held him for three and a half hours after the delivery. While the Oggs have been enjoying their three healthy children, the story of Jamie’s remarkable birth has helped publicize the growing body of research behind kangaroo care. It's not a miracle cure. Nurse researcher Susan Ludington pioneered kangaroo care in the United States, and she cautions: “It does not resurrect the dead.” Ludington, a professor of pediatric nursing at Case Western Reserve University in Cleveland, speculates that Jamie might have had an ineffective heart beat that was difficult to detect. What she’d like to think happened, Ludington says, is that skin-to-skin contact with his parents made him more alert. In 2005, she says, researchers identified a special set of nerves in babies that are “exceedingly sensitive” to pleasant human touch. Skin-to-skin contact with their mothers releases oxytocin, the so-called “cuddle hormone,” which affects multiple areas of newborns’ brains, Ludington says. The hormone makes their heart beat and breathing become more regular. Kangaroo care can also help minimize pain in preterm and full-term babies. Celeste Johnston, director of research at the McGill University School of Nursing in Montreal, has investigated its use in babies born as early as 28 weeks’ gestation. The length of time moms hold babies before procedures doesn’t seem to matter, says Johnston, who’s found even 15 minutes of skin-to-skin contact effectively minimizes pain. Fear plays a role, too, Spatz says. “I still see in most NICUs (neonatal intensive care units) that skin-to-skin is not a standard of care.” NICU babies tend to be tiny and fragile and hooked up to tubes and machines, and both nurses and parents worry about trying to move them, she says. Her hospital has filmed an instructional video that’s used in NICU’s around the world, Spatz says. It shows step-by-step how to transfer a critically ill baby from an incubator to the parent’s chest. Practicing with a doll first helps eliminate the fear factor.